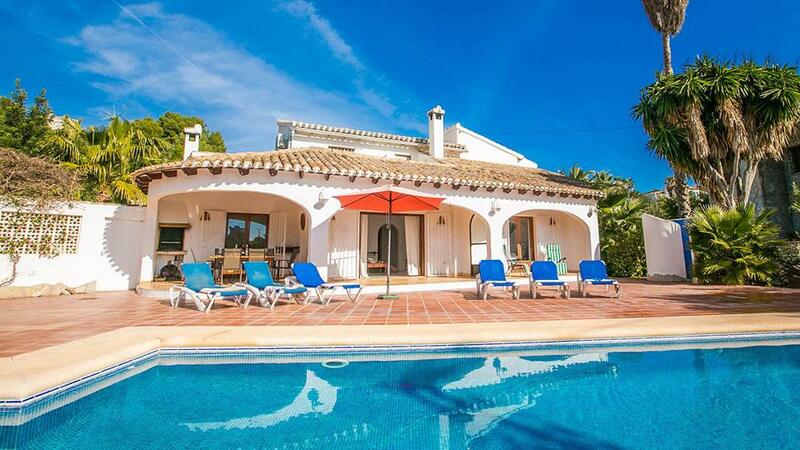 Situated in peaceful surroundings yet conveniently just a short drive from the centre of Moraira, Afiliador is a traditional villa that offers comfortable accommodation that includes wi-fi internet and UK Freesat television channels. 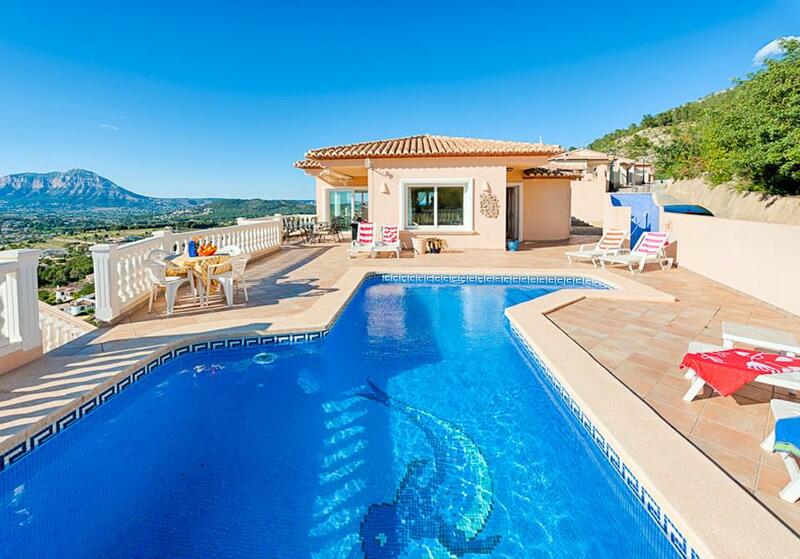 Featuring lovely sea and valley views. Also benefiting from an outdoor kitchen, barbecue area and air conditioned bedrooms. Casa Afiliador is traditional yet modern, well-maintained villa, which is the home of its owners for a major part of the year. 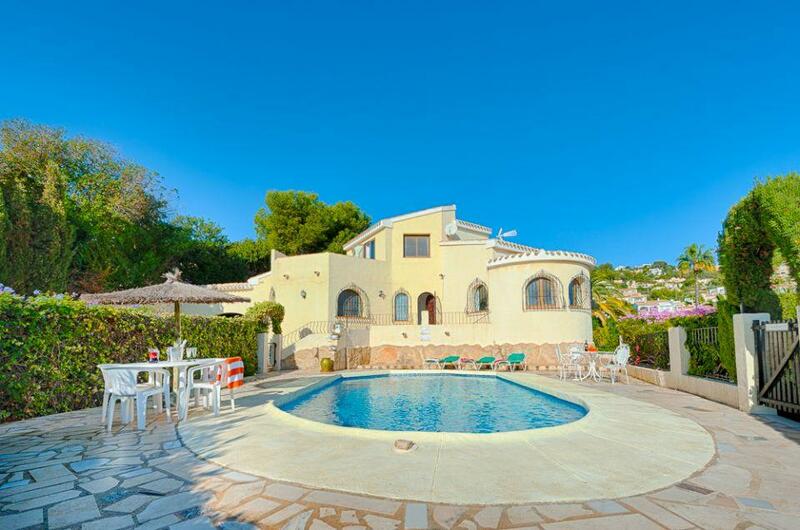 It is ideally suited to families looking for peace and quiet yet being just a short drive to local amenities and Moraira town and its golden sandy beaches. 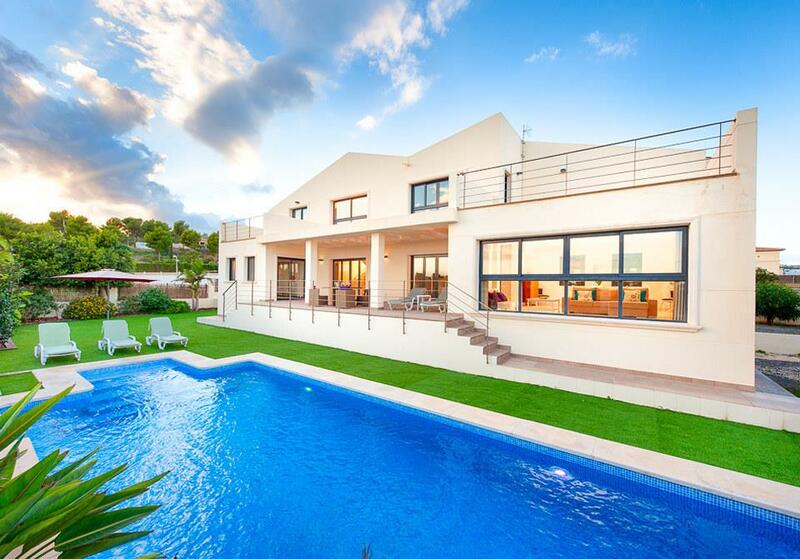 It offers impressive views across the valley to the sea. Features include an built-in barbecue and summer kitchen, an impressive roof-top solarium with views to the sea, a hedged and gated swimming pool area as well as UK satellite television channels, wi-fi internet and air conditioned bedrooms. Entry is up a driveway into a secure gated parking area for two or more vehicles. Entry to the villa is via a short staircase to an open terrace with a front door. The front door leads into a hall with access to all areas. The spacious lounge is carpeted and comfortably furnished with LED TV and satellite television. Attractive bay windows with views to the sea and a separate dining area (through an arch) which is also adjacent to the separate kitchen. The kitchen features a range of modern units with panelled doors, an electric oven, gas hob, microwave and fridge freezer as well as a rear door leading to the barbecue area and summer kitchen. The main (double bedded) room has an en-suite bathroom and there is another double bedded room with air conditioning and ample space for an additional folding bed, another with twin singles and a shared family shower-room which also has a washing machine. An elegant staircase, with timbered balustrades leads to the upper level with a master suite consisting of a double bedroom with en-suite bathroom. The upper floor also provides a roof-top solarium with a small kitchenette and fridge. The solarium provides perfect seclusion for sun bathing and magnificent views to the sea. The swimming pool measures 8m x 4m (depth 1'00 to 2'00) with internal tiles steps, is securely fenced and gated and has a surrounding hedge for complete privacy. The gardens are attractively landscaped and there is a shady barbecue area adjacent to the back kitchen door.